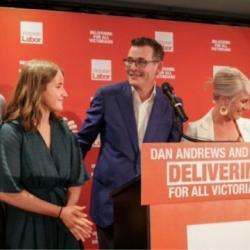 The big win by the Andrews Labor government over the Coalition opposition was branded as a triumph of rational policy making over the politics of fear: and this applies as much to climate and energy as it did to security and immigration. Victorians were presented with a simple choice when it came to energy: wind, solar and storage and a long-term plan for their grid integration, versus an ad-hoc and reactionary appeal to last century’s fossil fuel technologies. It was renewables vs coal. And make no mistake, the victory of the Andrews government is significant. Victoria faces the most challenging transition given its reliance on ageing, highly polluting brown coal generators, and the network constraints that threaten to limit the development of large-scale wind and solar in some of its most productive areas. To effect this transition, it needs a government that has a plan, rather than one that throws up roadblocks and indifference at every juncture. “It is positive for the renewable energy industry that the Victoria government has been re-elected, they have ambitious plans for our industry, that is good news,” Franck Woitiez, the head of Neoen, the biggest independent renewable energy developer in Australia, told RenewEconomy on Monday. “We now have reliable renewable energy … it is cheaper than conventional generation,” said Woitiez, whose company also owns the Tesla big battery at the Hornsdale Power Reserve. Now that the election has been decided, by a thumping majority, the 40 per cent renewable energy target for 2025 is locked in, and so too will a 50 per cent target by 2030, which will include nearly 2.6GW of rooftop solar on another 650,000 homes, and various schemes to encourage battery storage and distributed generation..
For Australia as a whole, it means that the transition to a renewables dominated grid is now unstoppable. Tasmania is already near 100 per cent renewables, South Australia is moving towards the same share even under a Coalition government, and both Victoria and Queensland have 50 per cent renewable energy targets in place for 2030. Only NSW fails to have an interim target, but as the Australian Energy Market Operator has pointed out in its Integrated System Plan, it is facing an equally dramatic transition by default – namely because it has no choice but to replace the ageing black coal generators that will have to close in the next 10-15 years. The choice of technology is now clearly a no-brainer, as analysis from BloombergNEF, Lazard and even the International Energy Agency informs us. That means that NSW will likely match Victoria and Queensland with a greater than 50 per cent share of renewables by 2030. Even the NSW Coalition government appears to not just accept this, but embrace it – as revealed by the Emerging Renewables and the transmission plans it has unveiled over the past month. The ACT, which operates within the NSW grid, has already taken steps that locks in the equivalent of all its electricity needs from renewables by 2020. The Northern Territory has a 50 per cent renewable target by 2030, and while it has taken no major steps to move down that path yet, the die is cast by the need to replace its major gas generator within a decade. (In a barely reported quip by Morrison, the prime minister promised that Australia would produce the hydrogen needed for the Tokyo Olympics in 2020). That leaves only W.A. wrestling with the transition. The new Labor government there has no explicit renewables target, but like the Coalition in NSW it is facing an ageing fossil fuel fleet whose cost to consumers has been heavily subsidised by successive governments for the past two decades. Its path to a renewables-dominated grid is complicated by deep-seated market regulations, but this is now being addressed – not exactly at great speed – but should then allow the exploitation of wind and solar in the state with the best resources of any. So, all eyes now turn to the NSW state poll in March, and the federal election – now likely to be in May. Labor’s Mark Butler observes that the Liberals have gone to an election twice in the last 12 months attacking renewable energy policies and promising to build new coal-fired power stations – and lost. (Not to mention the various by-elections in Wentworth and Wagga Wagga where the Liberals lost long-standing seats from climate and renewable-focused independents). But don’t expect a change from the Coalition anytime soon. In the Murdoch press there was barely a mention of the climate and renewable energy policies in the coverage of the Victorian election. Of course, Andrew Bolt said that Victoria Liberal leader Matthew Guy’s biggest mistake was his failure to challenge climate science itself – apparently doing nothing about climate change, promising to kill the renewables target and build a new coal-fired power station was not enough. Bolt wanted outright denial. And his stable mates at 2GB reportedly said exactly the same thing, with Ray Hadley demanding Morrison commit to a new coal-fired power station. Liberal moderates – panicking about their future and facing a wipe-out – are now calling on the Coalition to dump their hard-line policies. The concern even extends to Tim Wilson, formerly of the climate science-denying and renewables-hating Institute of Public Affairs, who now appears to regret the ideological split over wind and solar encouraged by his former employer. “If anybody thinks that there’s this great public sentiment out there, that people deep-down really hate renewables and they’re hugging something like coal, I say again: ‘get real’,” he said on Sky News. But to moderate their policies, the Coalition would have to sweep away their entire leadership team. Prime minister Scott Morrison is forever tarnished by his coal-waving antics in federal parliament; energy minister Angus Taylor by his long and intense campaign against renewables; environment minister Melissa Price by her incompetence; deputy Liberal leader Josh Frydenberg by his scare campaigns against “intermittents”; and the Nationals leadership because they have no clue. Federal Labor’s policies are based around a 50 per cent renewable energy target and a 45 per cent emissions reduction target. The former should be reached in a canter, simply because of what is locked in by the states. Like South Australia, it may find its targets overtaken by events. But it should be – it plans another $10 billion for the Clean Energy Finance Corp and $5 billion for an “Energy Modernisation Fund”, along with a focus on battery storage. It’s a more difficult challenge to meet the economy-wide emissions targets. Butler is promising to add more details in coming weeks, but it seems certain that it will take up the new industry call for carbon pricing and offer sector-specific schemes. Across industry, however, there will be a shift to clean technologies, not just in electricity, but also in heat, transport and manufacturing techniques.